In the afternoon of August 21 in 1991 a fireball, followed by a huge smoke trail and a loud explosion, terrified a young nomad in north-western desert of Niger. The boy, seventh child of his father, a member of a local nomadic Tuareg tribe, was tracking a stray goat at the foot of Mt. Tazerzait in the north-eastern Tamesna, a pleistocene gravel plain in the Republic of Niger. It was the day of his seventh birthday. Searching for the heavenly intruder, the boy found an impact pit, and in its centre rested an enormous black rock only half buried in the bright clay soil. What a spectacular birthday gift he may have thought. The next day the boy led his brothers to the site and they estimated the weight of the rock to exceed 200 pounds. They had no means to transport such a heavy weight, so they finally decided to break the huge rock into more convenient loads. 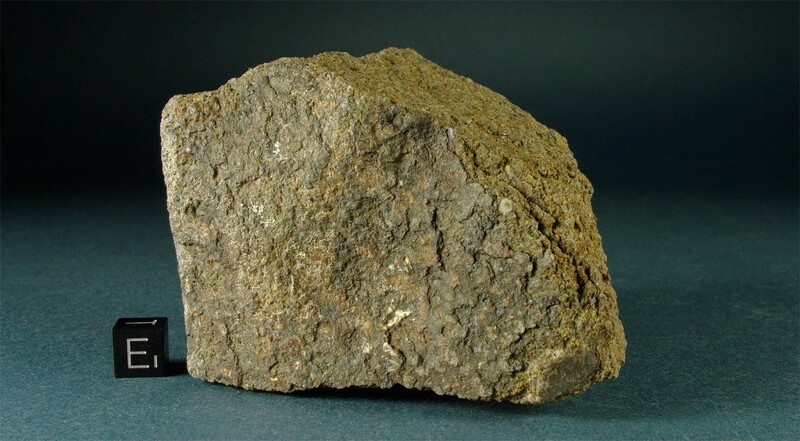 During the following days the gang hammered the meteorite into more than fifty pieces, which resulted in approximately 100 kilos of meteoritic fragments in total, the largest weighing 30 kilos. In the afternoon of August 21 in 1991 a fireball, followed by a huge smoke trail and a loud explosion, terrified a young nomad in north-western desert of Niger. The boy, seventh child of his father, a member of a local nomadic Tuareg tribe, was tracking a stray goat at the foot of Mt. Tazerzait in the north-eastern Tamesna, a pleistocene gravel plain in the Republic of Niger. It was the day of his seventh birthday. Searching for the heavenly intruder, the boy found an impact pit, and in its centre rested an enormous black rock only half buried in the bright clay soil. What a spectacular birthday gift he may have thought. The next day the boy led his brothers to the site and they estimated the weight of the rock to exceed 200 pounds. They had no means to transport such a heavy weight, so they finally decided to break the huge rock into more convenient loads. 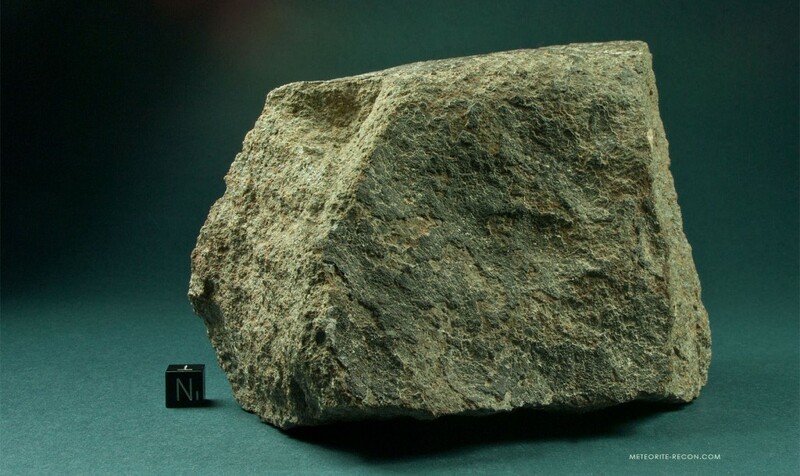 During the following days the gang hammered the meteorite into more than fifty pieces, which resulted in approximately 100 kilos of meteoritic fragments in total, the largest weighing 30 kilos. Members of the family visited scholars and geologists in Agadez and Niamey to show the boy’s finds, but none of them believed their story or seemed to care. The knowledge of the meteorite, even though its fall had been witnessed, was about to slip into oblivion. It was not until five years later, when a young Algerian overheard the story of the meteorite’s impact being told during his stay in Tamanrasset. He managed to acquire most of the meteorite and approx 40 kg were sent to Rolf Buehler in Switzerland. Buehler organized the petrological and chemical analysis and classification of the meteorite, which was subsequently done by Prof. Juergen Otto from the University of Freiburg in Germany. The fragments we were able to study show patches of fusion crust up to 0.8 mm thick. The crust bears witness to the treatment the meteorite had received. Its original roughness has been abraded to an extent, most probably not only due to the violent impact of the heavy mass in the soil, but also caused by inappropriate storage and transport of the fragments together in a sack. Although the material displays little oxidation, hardened clay deposits in the cavities of the fusion crust indicate that the meteorite fragments had been exposed to the elements for an extended period. Mount Tazerzait shows a sand colored matrix with few chondrules and chondrule fragments up to 8 mm in diameter (A. Pilski, personal correspondence). 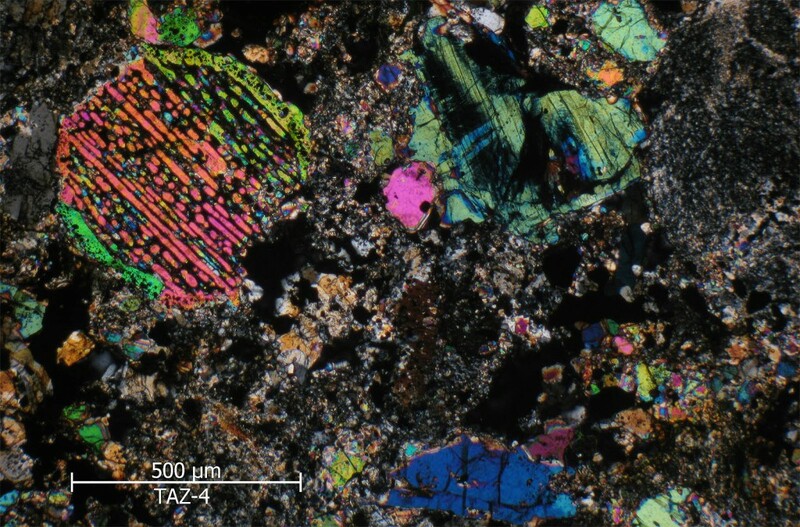 A large portion of the matrix is composed of broken and fractured chondrules, often with the missing parts of the chondrules not detectable in the cut surfaces. The olivine and pyroxene crystals are often clear and transparent giving a striking contrast to the troilite embedded in the matrix. The striking occurrence of interstitial pores, often in interconnected systems, is visible to the naked eye. Despite the pores the material is very hard, much like a “welded pyroclastic rock” as the versed expert Andrzej Pilski has put it for Mt. 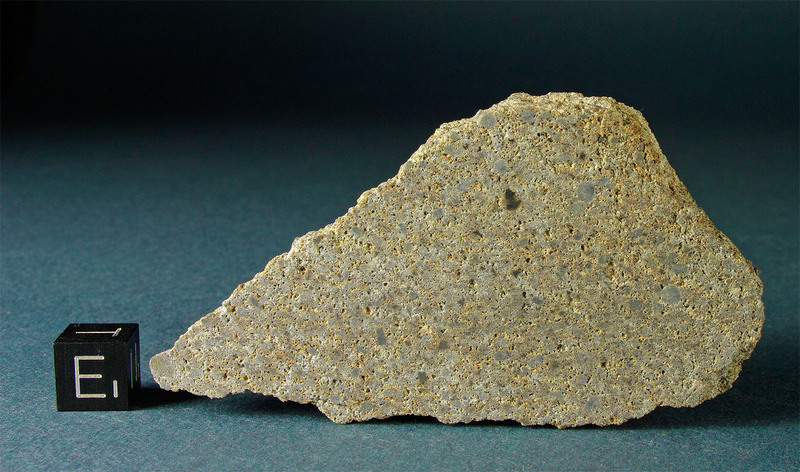 Tazerzait’s structural relative, the L5 chondrite Baszkówka. Although Mount Tazerzait falls into the group of meteorites named ordinary chondrites it shows in fact a most extraordinary lithology. Contrary to most other ordinary chondrites Mt. Tazerzait displays very little if any impact induced shock alteration. Its shock stage was determined with the lowest degree of S1. This is insofar peculiar as the material must have been separated from its mother body very smoothly, before it started its journey towards earth. With approximately 61 million years the cosmic exposure age of Mt. Tazerzait was found to be remarkably long compared to most other chondrites. And contrary to almost all other members of this group, Mt. Tazerzait has an unusually high porosity of 12.6 percent, with a high amount of vugs in its matrix, often with euhedral to anhedral crystals which have formed in these interstitial pores. An even higher porosity has also been observed in the L5 meteorite Baszkówka from Poland, with which Mt. Tazerzait also shares the petrologic type, the same Fa/Fs contents, the low degree of shock, the long cosmic exposure age, the date of the fall at the end of the month of August, and the noble gas abundance. 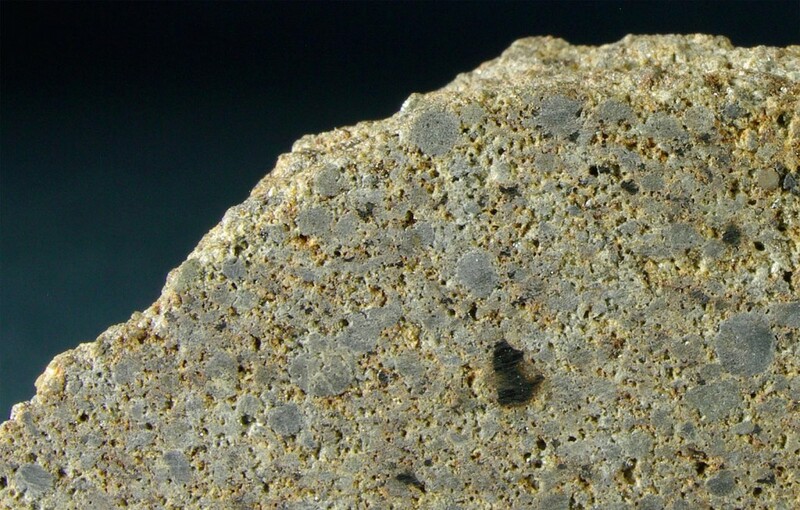 Similar and partly even higher porosities have also been found in a small number of other chondrites such as Tjerebon, Miller, NWA 2380, Sahara 98034 and Nuevo Mercurio. 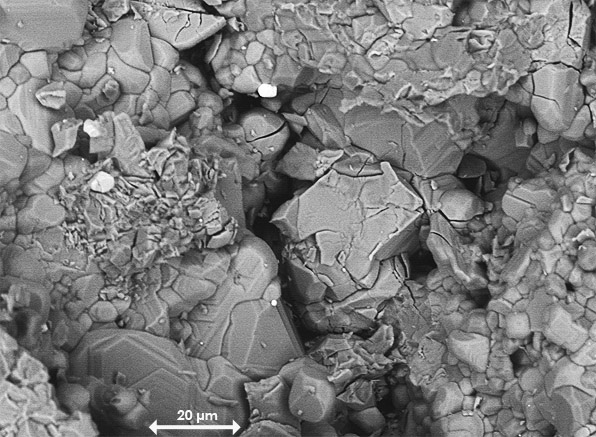 While some researchers stated porosity in meteorites is a primary feature only caused by a lesser degree of compaction, others have suggested more sophisticated theories of formation. A team of the Wroclaw University around Tadeusz Przylibski suggested a plausible model for the evolution of the porous parent body, which also takes into account that the porous material studied consists of a mix of unaltered and melted components. According to their findings the porous material has formed on a small asteroid or planetesimal as a result of slow gravitationally induced accretion of poorly assorted components. The most likely scenario for such a formation is an environment following the collision of two asteroids or small planetesimals. The collision must have melted considerable parts of both bodies, but in the resulting hot cloud of debris parts of the parent bodies thrown into space during the early phase of the collision have escaped remelting. After the collision the debris fell back onto the planetesimal and the material accreted under relatively high temperatures. The density of the post-collisional cloud prevented rapid cooling. The slow falling of the particles to the surface under high temperatures welded together a strong and highly porous rock. More porous and less compacted material, such as represented by Baszkówka, would have been located relatively near to the surface, while lesser porous and more compacted material, like Mount Tazerzait, must have originated from deeper within the parent body. (Przylibski et al. 2003). Hydrothermal activity usually takes place in comets: When approaching the sun gases frozen in the core of a comet begin to sublimate and present water ice melts. It is then that hydrothermal reactions take place altering the original nature and composition of the parent minerals. It has therefore been suggested that asteroids producing porous material altered by aqueous solutions could indeed be called comets, since initially they represented open systems, in which water could circulate.